Greece is one of the most historically rich nations, with a culture and civilization that exceeds five thousand years of continuous human activity, producing such notable historical influencers as Alexander the Great, Socrates, Plato, Aristotle, and Homer; it’s no wonder that some other individuals well-known throughout Greece remain unknown to other nations. One such individual is Athanasios Diakos who is more or less a modern King Leonidas, as you’ll soon see. Diakos was born Athanasios Nikolaos Massavetas in 1788, in a small village in central Greece, then under Ottoman occupation. His father, a poor man and son of a legendary rebel who was killed in a battle against the Ottomans, found himself unable to bear the burdens of his large family, and thus sent the then 12-year-old Diakos as a novice to the nearby monastery of St. John the Baptist, where he could also receive a proper education. Five years later, Diakos became a deacon, and thus became known as “Diakos,” meaning “deacon” in Greek. However, this period of his life didn’t last long. At the young age of 19, Diakos killed an Ottoman Pasha, because, according to tradition, the elite Ottoman was sexually harassing an adolescent. Because of the fatal incident, Diakos had to flee into the nearby mountains to avoid the Ottoman authorities and the subsequent death penalty. 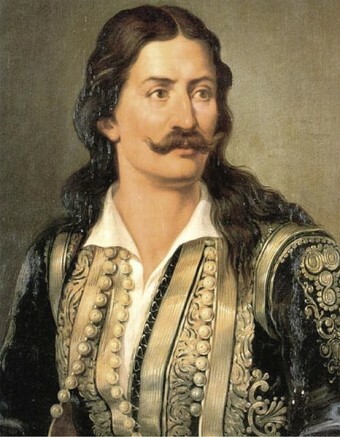 He then became a Klepht, and one of the rebellious armed Greeks who fought against Ottoman occupation. On the battlefield, Diakos seemed to find his true calling, excelling to become one of the best and most feared warriors among the rebels. However, Diakos’ deeply-held Christian faith conflicted with his life-style at the time, and so he sought to become a man of peace once again. As a result, he changed his appearance and returned to the monastery of St. John the Baptist, to once again dedicate his life to God. About a year after his return, a fellow Greek betrayed him and Diakos was arrested by members of the Ottoman army. He managed to escape only a few hours before he was to be hanged, with the help of his mates from the mountains who had learned about his capture and rushed to help their old friend. In the following years, Diakos would become the indispensable left hand of another legendary figure of the Greek War of Independence, Odysseas Androutsos. He would also go on to become an honorary member of Filiki Eteria or Society of Friends, a secret organization that prepared the grounds for independence and freedom in Greece. By 1820, Diakos led his own army of Klephts , becoming the bane of the Ottoman military. In April of 1821, a month after the Greek War of Independence had officially begun, the Turkish forces (nearly 10,000 men) with Omer Vrioni and Köse Mehmed, the two foremost Ottoman generals, departed from Thessaly to beat the Greek rebels in Central and Southern Greece. Their fear of Diakos and their desire to see him naturalized was so great that they chose to focus the majority of their efforts on him and his band. Diakos and his small army of Klephts, flanked by fellow Independence fighters, Dimitrios Panourgias and Yiannis Dyovouniotis, decided to stop the Ottoman advance with a total 1,500 men, by taking defensive positions in Alamana, a place near Thermopylae, where two thousand years ago Leonidas and his 300 Spartans had heroically fought for their freedom against a massive army of Persians. In yet another ironic déjà vu, Greeks once again found themselves fighting for their freedom with a major disadvantage in terms of manpower. Soon, the vast majority of the Greek army had to withdraw and Diakos found himself fighting against thousands with only 48 men by his side. At one point, one of his men brought him a horse to escape, but Diakos refused to retreat. After hours of an exhausting and excessively bloody battle, the Ottoman military finally captured and bound the severely wounded, Diakos, who at this point had several broken ribs. He was then taken to the Ottoman generals. I was born a Greek, I shall die a Greek. Köse Mehmed, the Ottoman Turk general who ranked even higher than Vrioni, shocked, but full of admiration from Diakos’ bravery, offered him medical assistance, promised to make him a high-ranking officer of the Ottoman army, and bequeath him a beautiful girl, from Mehmed’s harem, as a wife. He only wanted Diakos to convert to Islam. Diakos once again rejected the offer. At this point, his fate was sealed. Diakos didn’t have the good fortune of dying in battle like the great Leonidas and his Spartans, a fate somewhat preferable to impalement. He did, however, show exactly the same type of bravery and courage as the legendary king, and fought similar odds and for similar reasons relatively close to the same ground. Even though his name remains unknown to most people outside of Greece, Diakos ranks among the world’s most historic warriors, giving his life to one of the most beautiful ideals known to mankind: Freedom! Your articles are like oasis in the desert!!! Thanks a lot! Crazy good, Theo, bravo. This is a wonderful article, and I think you’re right. It might be one of your best. It is truly an honor to be born a Greek with ancestors such as Athanasios Diakos. We are seeing the same threats made by ISIS in Iraq, convert or die today. Times do not change much. Not Greek! All these heroes of the “Greek” Revolution were Albanians! Just like that Diako! I ask you to accept the true History and not to manipulate it!